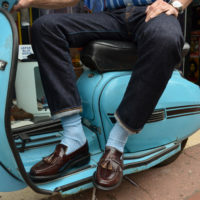 We have split our trouser range into two sections; ‘Sta Prest’ and ‘Suit Trousers’. Both types of trousers are cut to the same slim pattern, the only difference being that the suit trousers have unfinished hems and are, as the name suggests, from our suit production, meaning that they are made in higher quality fabrics. 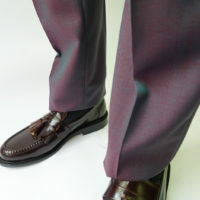 Sta-prest trousers are all finished with a 32″ inside leg, the rise on all of our trousers is on average 10″.